n Monday, the World Meteorological Organization released another reminder of the planetary predicament we’re in: The earth’s atmosphere permanently passed the 400 parts per million (ppm) threshold last year. It’s the first year in human history where carbon dioxide levels have reached the symbolic milestone for an entire year. But it certainly won’t be the last as humans continue to treat the atmosphere as a waste dump for carbon pollution. You might have heard that the world reached the 400 ppm milestone permanently this September. And it did, according to data collected at Mauna Loa Observatory, which is considered the gold standard for carbon dioxide monitoring. 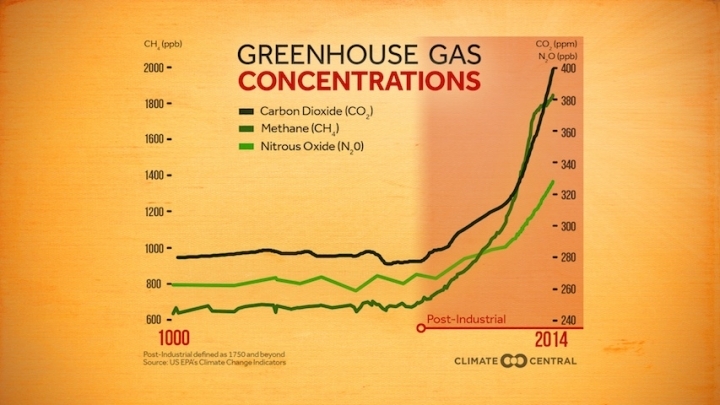 But it’s not the only place in the world where scientists are monitoring carbon dioxide. The WMO monitors a network of 123 stations from pole to pole. And because carbon dioxide doesn’t mix evenly in the atmosphere, some have been well above 400 ppm for awhile while others have only reached the plateau for a few months a year recently. Average them together over the year and voila, you have a recipe for a more complete snapshot of the entire atmosphere. 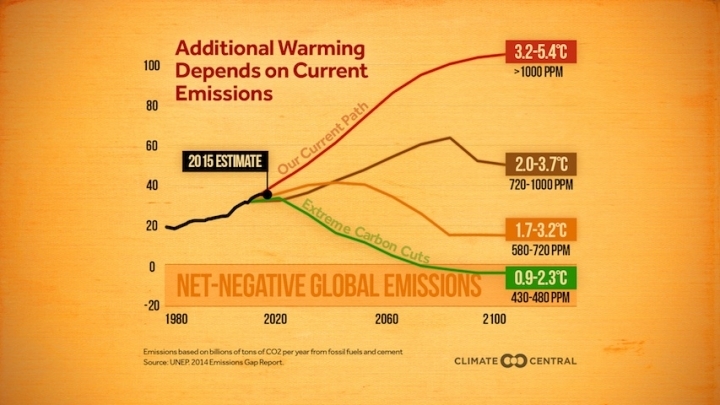 The impacts of climate change are only expected to get worse unless we slow our carbon dioxide emissions. And yet those emissions continue to rise at an increasingly rapid pace, eating away at the carbon budget. It’s not a pretty picture. Human’s penchant for burning fossil fuels has increased the amount of carbon dioxide in the atmosphere 144 percent since the start of the Industrial Revolution. That’s caused global temperatures to cross the 1.5°C threshold for a few months this year, sea levels to increase nearly a foot, heat waves to become more intense and oceans to become more acidic, among other impacts. Aided in part by 2015’s strong El Niño — but driven mostly by fossil fuel use — the jump in carbon dioxide last year was the largest annual increase on record. It’s a record but in line with trends as the growth of the global economy has coincided with an increase in fossil fuel use and carbon emissions. The WMO warned that those rates could increase even more dramatically in the future. That’s because the planet’s natural carbon dioxide sinks — trees, plants, soil and the oceans — could eventually fill up. They’ve currently absorbed about half of all human carbon pollution to date. If they start to fill up, though, carbon dioxide will back up into the atmosphere and speed up the transformation of the planet. 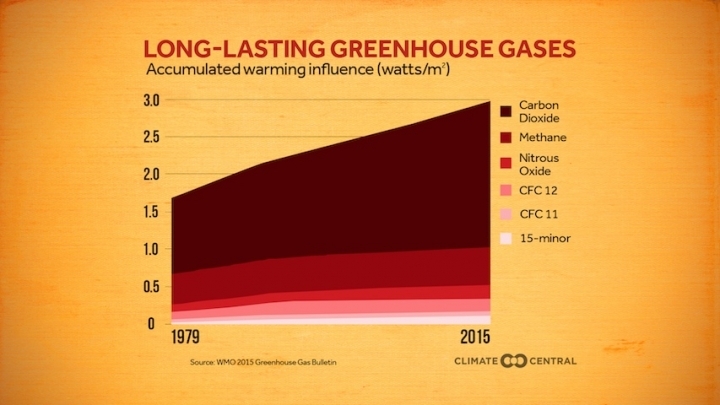 Carbon dioxide isn’t the only greenhouse gas piling up in the atmosphere. Methane and nitrous oxide — which together with carbon dioxide and chlorofluorocarbons account for 96 percent of all greenhouse gas warming — also reached record annual highs in 2015. The only sliver of good news is that a few chlorofluorocarbons have declined slightly. That’s due in part to the Montreal Protocol, which was focused on limiting these gases — used largely for air conditioning — because of their effect on the ozone hole. Their replacements are even more potent greenhouse gases (which also hit a record high this year), but a new agreement signed earlier in October will limit their use in the coming years. The report comes out a few weeks ahead of international climate talks in Morocco. It’s a good reminder to negotiators of what’s already been done to the atmosphere and what’s at stake if the world doesn’t change its carbon polluting ways.